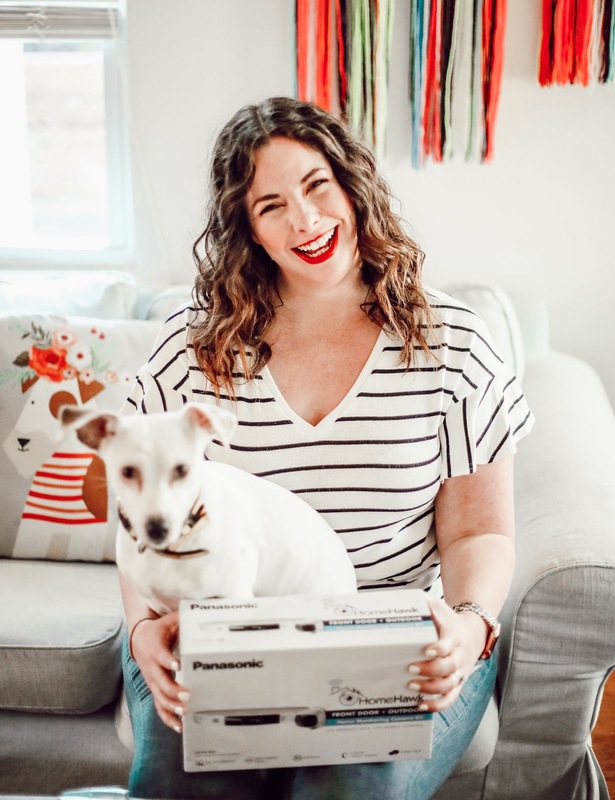 Thank you to Panasonic HomeHawk for sponsoring this post, all thoughts and opinions are my own. We've been in our home for almost four years, and I have a love-hate relationship with our neighborhood. 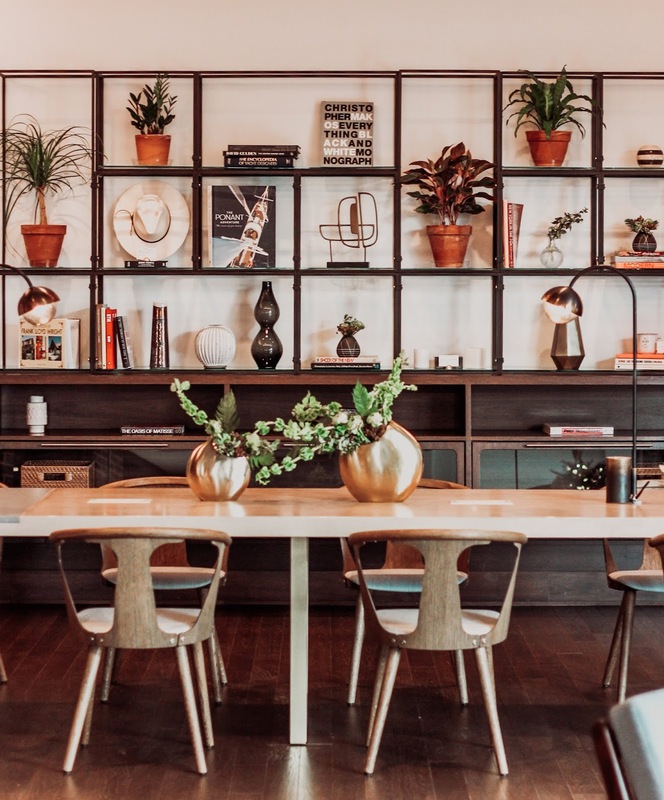 It's a transitional area in Dallas, and it has come A LONG WAY in our four years there. With that said, I still don't trust packages being sent to our house. I remember one of my first campaigns I had in the new house was for a wine brand. They sent me three $100 gift cards for a giveaway, and some swag. The box was confirmed as delivered, yet I never saw the box. I don't know what happened, but I can only imagine it was swiped off the front porch before I had the chance to collect it. While we do have a neighbor who is often at home during the day, I'm certainly not going to rely on her to spy on our front porch all day every day. Enter your new favorite gadget, the Panasonic HomeHawk. It's an outdoor home monitoring system, that is incredibly easy to install and set up, very user-friendly. Unlike other products on the market, you don't have to pay a monthly storage fee. You just get a one time SD card and you're good to go. The camera itself is wire free, and is set at a 172 degree angle so you can actually see more than just your front porch. We also thought it was great for our backyard too. We park our cars in the backyard, because it is gated. With that said, the gate isn't automatic so it doesn't lock easily. It's nice to have a camera also monitoring both the gate and the backdoor to our house. Major peace of mind for when we are traveling. 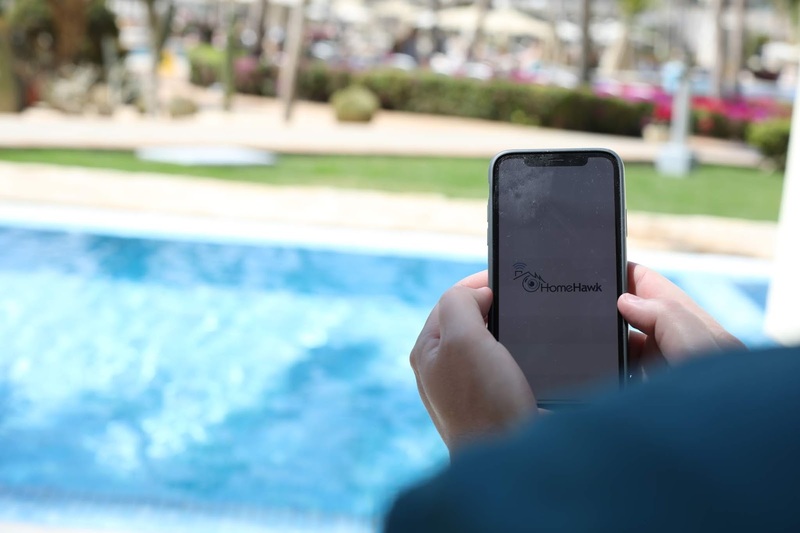 It's 2 way talk and waterproof, basically it has everything you need for home monitoring when you're away from the house. 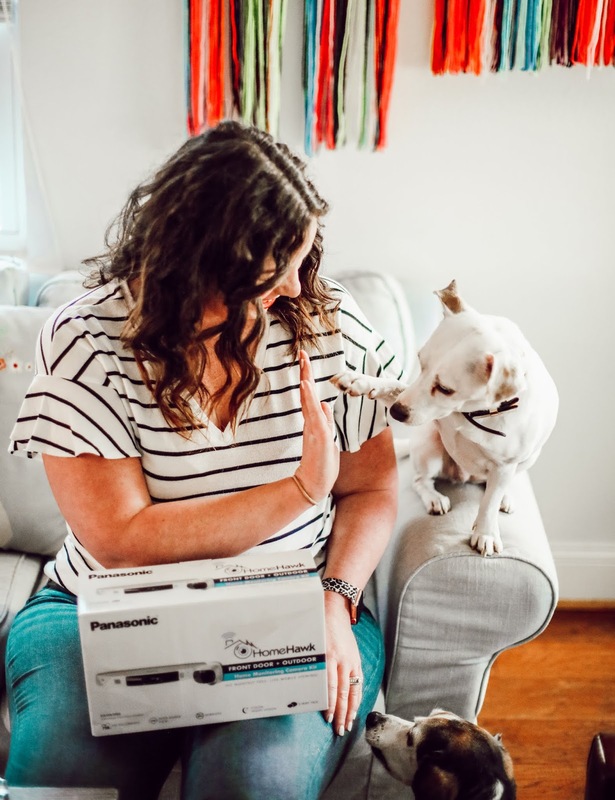 Have your packages delivered and gain peace of mind knowing they're safe because you're watching over them. I'd also recommend getting a second kit to monitor any backdoors, or even monitor your detached garage if you have one of those - like we do! 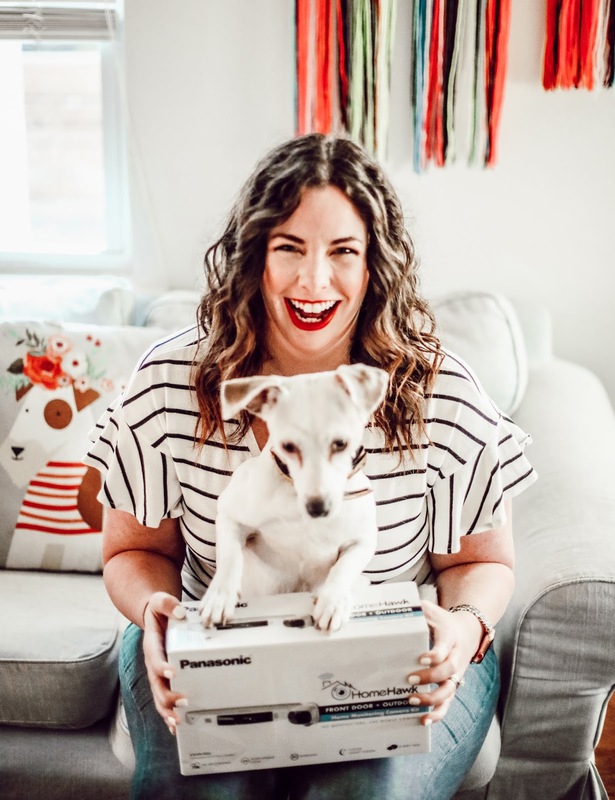 Here is a little video I put together that goes into a little more detail about the HomeHawk and how it works for our family! We got everything set up and ready to rock and roll before our Cabo trip. We were able to actively monitor our home right from our pool chair. The app will ding you when someone approaches the camera, but my absolute favorite feature is that it TELLS THE OTHER PERSON (aka - a potential intruder or package stealer) that they're on camera. A speaker tells them "Premises is Being Monitored." Personally, if I were a package thief that would be enough to scare me away! We ended up being those weirdos that took great enjoyment on seeing the pups on the cameras with the Rover sitter while we were gone. We tried to talk to Veenie through the two-way talk, but very sadly she was more interested in sniffing every blade grass and peeing where Gee had just peed. Pretty typical, TBH. 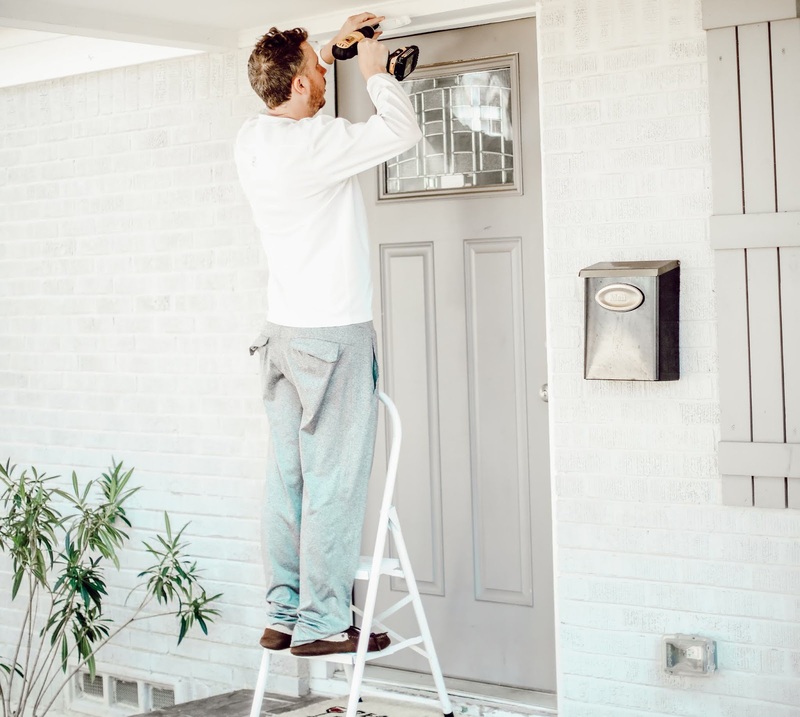 I highly recommend this product, and it will be a clutch addition to our front and back doors for the next few months when we have quite a few weekend getaways. Plus, I'll look forward to watching the pups while I'm gone, because I'm a stage five clinger. 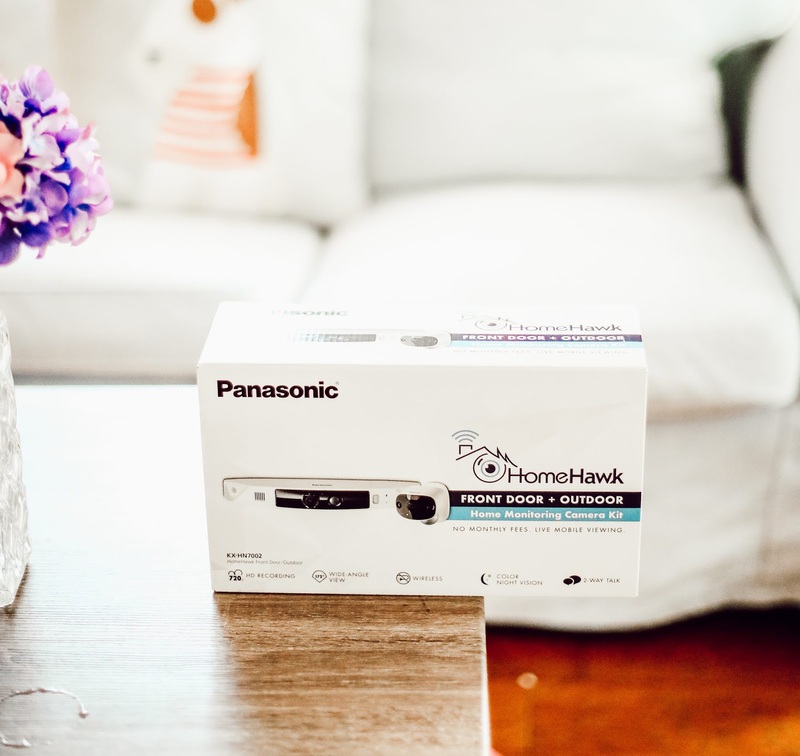 For more information, or to purchase the Panasonic HomeHawk || CLICK HERE! Thanks to Panasonic for sponsoring today's post. All opinions are my own. 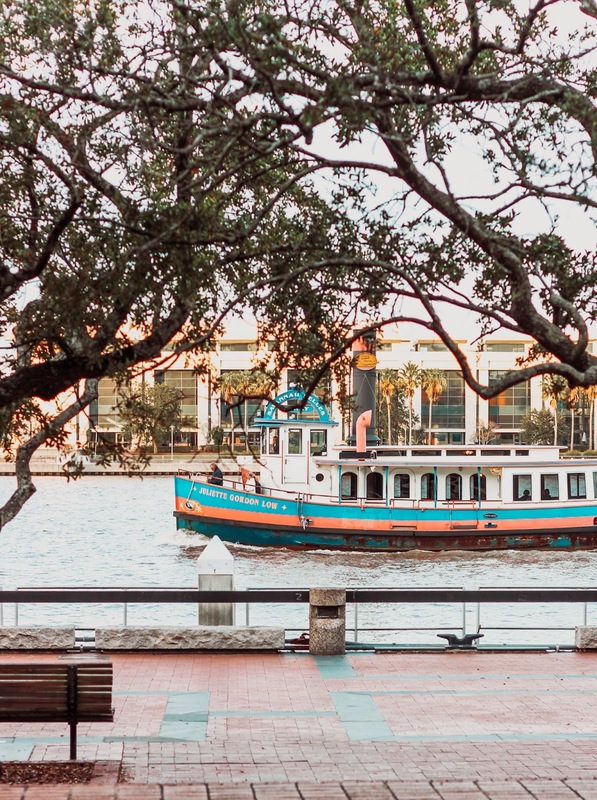 A few weeks ago, I found myself in one of the nation's most beautiful cities, Savannah, Georgia. I'd been to Hilton Head as a kid plenty of times, but never to Savannah. That is, up until just recently when I started my new job with Makeready. We have a beautiful hotel there, The Alida! 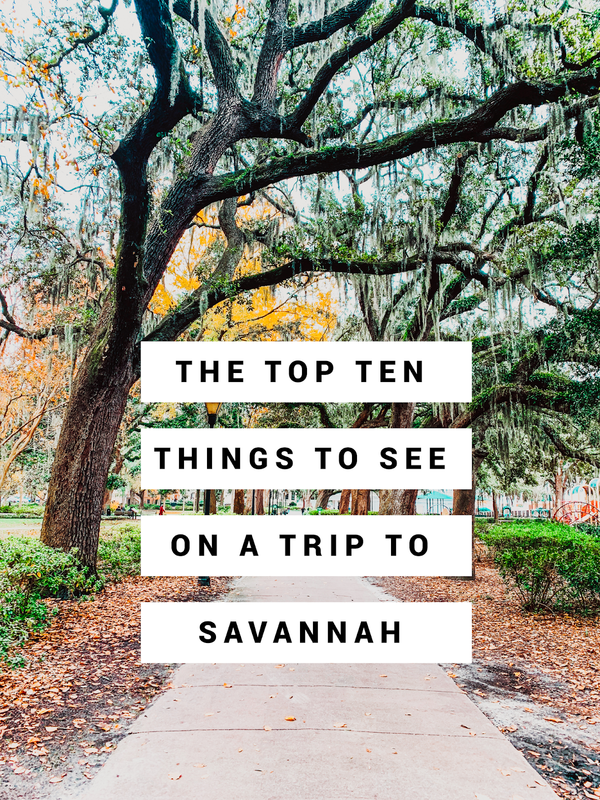 After a few work trips, one of which was spent simply exploring the city, and then my most recent trip with my friends at Toyota, I've decided on my top 10 favorite things that a visitor must do, see and eat in Savannah. It's no secret how much I adore Toyota both as a brand to work with, and for their cars. 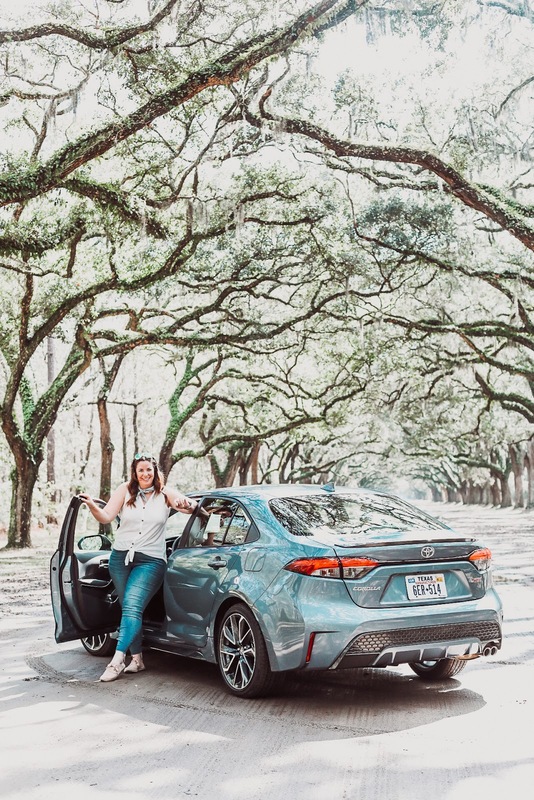 This trip to Savannah was centered around their all new 2020 Toyota Corolla. The Corolla is literally the world's best selling car, and is a household name at this point. Although when I was a kid my dad (a ford dealer for 35 years) used to mis-pronounce it TAY-ota, which made me cringe. I think he just did it for me to be like, "DAD THAT IS NOT HOW YOU SAY IT." All jokes aside, for so many teens, a Corolla was their very first car. You might have an impression of this car in your mind, but that vision is NOTHING like the 2020 Toyota Corolla. This bad boy is sporty AF and swimming with features (I'm obsessed with the touch screen display with Apple car play), incredible audio from JBL and of course equipped with all of the Toyota safety features I've bragged about in the past. This one has Toyota Safety Sense™ with a pre-collision detection system that can help detect a vehicle, bicyclist or even pedestrian in certain situations, even in low light. Shoot, there's even a hybrid version now that gets 53/52 mpg! Yowza, where was that when I was 16 years old, driving all over Midlothian, Virginia just because I could. I remember I used to put $5 in my tank at a time because that was all I could afford. 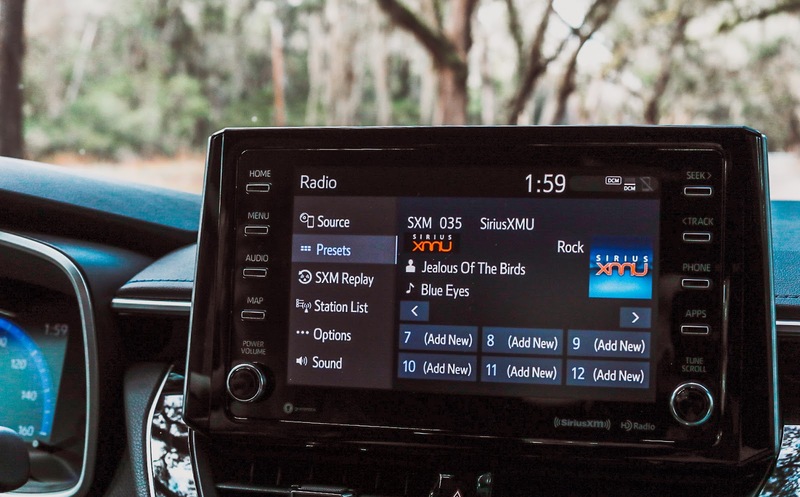 This is such a great, affordable car with all of the technology bells and whistles kids want these days - there's even wifi on board! BOOM! 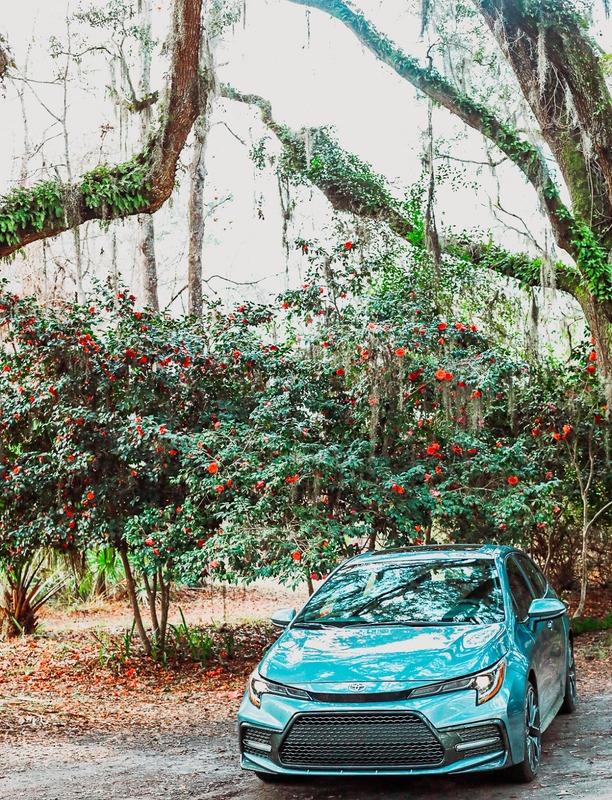 We had a great time scooting around Savannah in this cute, sporty car. It was easy to drive, but had plenty of pickup to get you going the right speed on the highway in a flash. Flying into Savannah is EXPENSIVE, even from the mega hub that is Dallas. So, if you're within driving distance, I'd recommend a road trip. 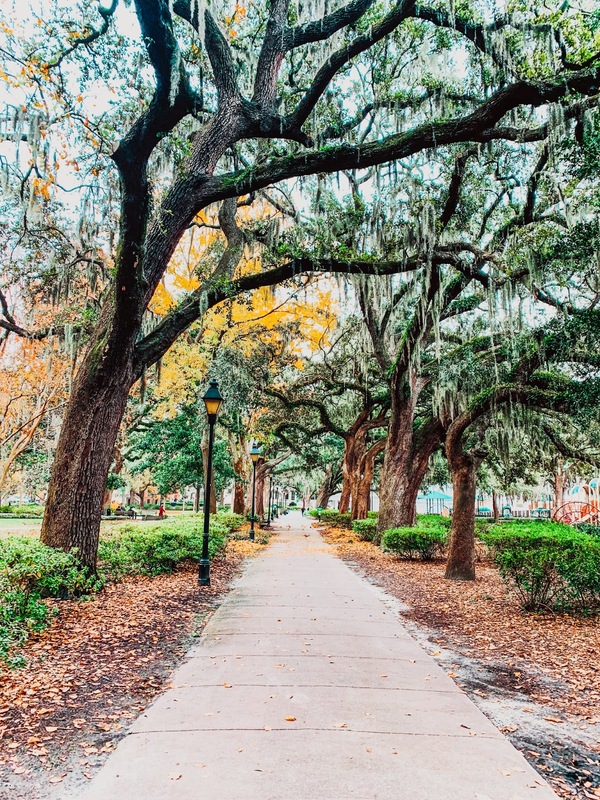 So, grab your Corrolla (don't have one - go buy one *wink*) and take a tour of Savannah by hitting the 10 favorite spots I think a tourist needs to see. If you don't want to drive through the site, it is free to visit. BUT - I recommend paying the $10 it costs to get in because it's beautiful and that money goes to historic maintenance. 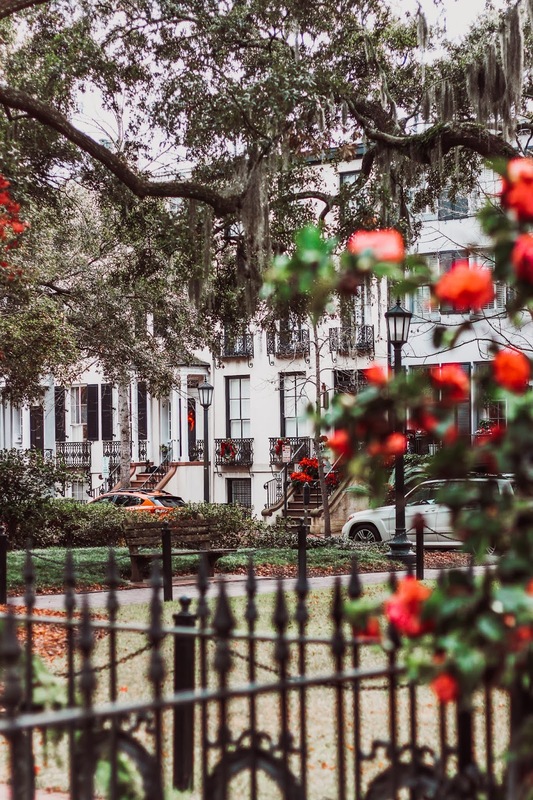 This spot in Savannah will take your breath away. Assuming you're staying in the downtown Savannah / Riverfront area, you can walk to this outstanding park. I mean really though, there is beauty at every turn and tree. I was there during the winter and fall months, so I'm bursting at the seams to see it all decked out in spring colors! 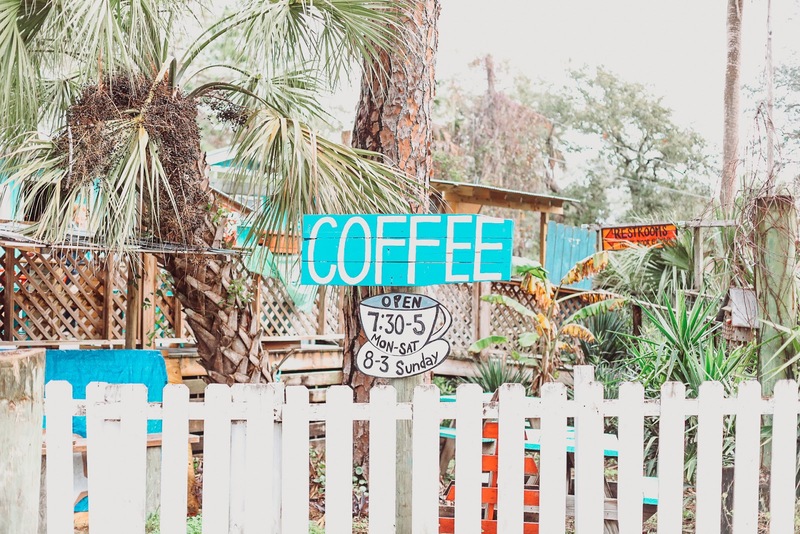 Tybee Island is home to beautiful lighthouses, great shopping, beautiful sunsets on the beach and the cutest coffee shop, Tybean Coffee. I love a good pun. 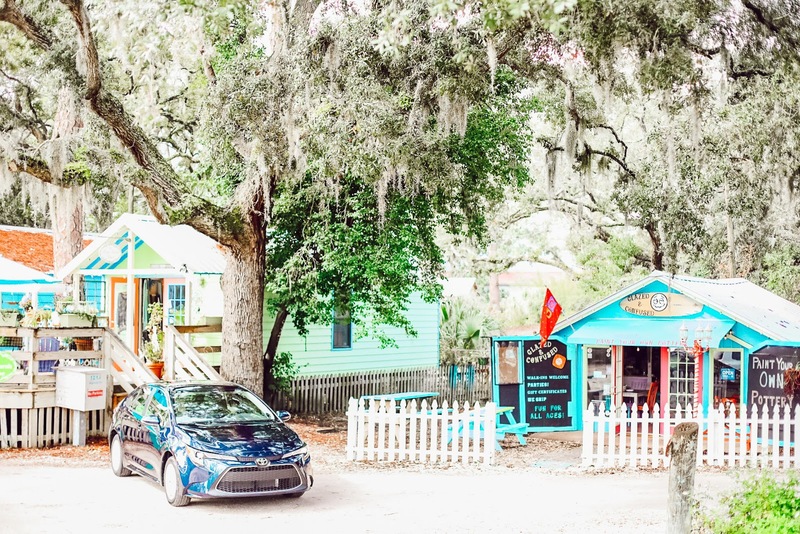 You'll be greeted by the coffee shop first, so grab a coffee, jump in your Corolla, and get to exploring! The stairs down to the Riverwalk are what I like to call - death stairs. No for real, they're so steep, a billion years old (give or take) and are actually really creepy. I understand they're historic and lovely, yada yada yada, but if you prefer to not leave with a broken leg, I say avoid those stairs by going through one of the hotels. Then take their elevator down to their bottom floor. Just a little pro-tip from me to you. The riverwalk has great shopping, bars on bars on bars, and cute little candy shops. They even have a little covered market, too! Yup, you can take your cocktail to go, New Orleans style, in Savannah! So grab a to go beverage and get your comfy shoes on and go for a walk. Savannah is known for their 22 squares scattered through the historic district. 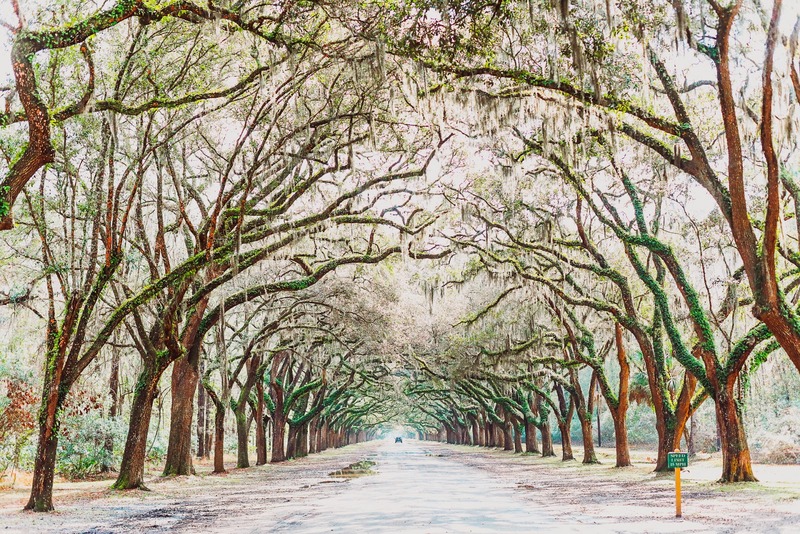 The squares are all covered in old live oak trees, and make you stop to really appreciate the beauty of the world. One of the squares, Chippewa Square, is actually where Forest Gump sat on his park bench! Kewl! MERICA! 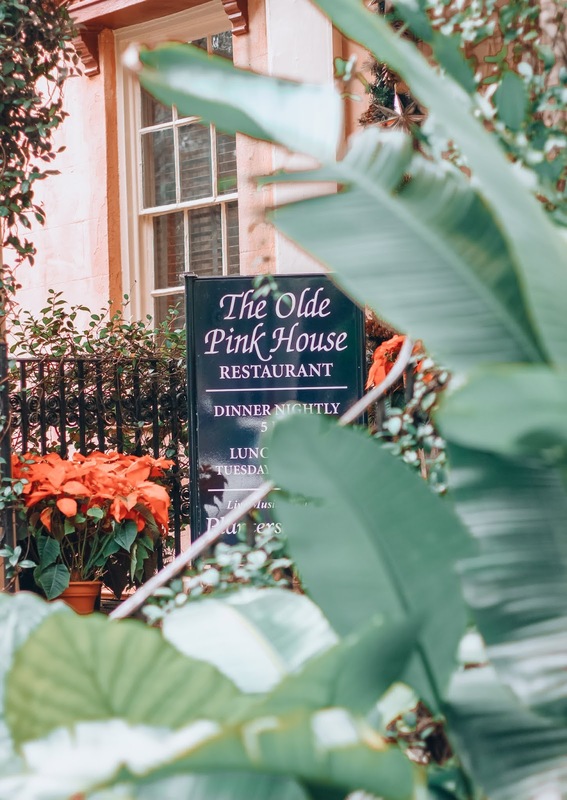 Savannah's most historic, and incredibly popular must visit restaurant, the Olde Pink House was originally built in 1771. Very sadly though, they experienced a fire in their upstairs ballroom in December 2018. Once they're back up and running (expected to be April or May 2019), make dinner reservations here and be part of history! 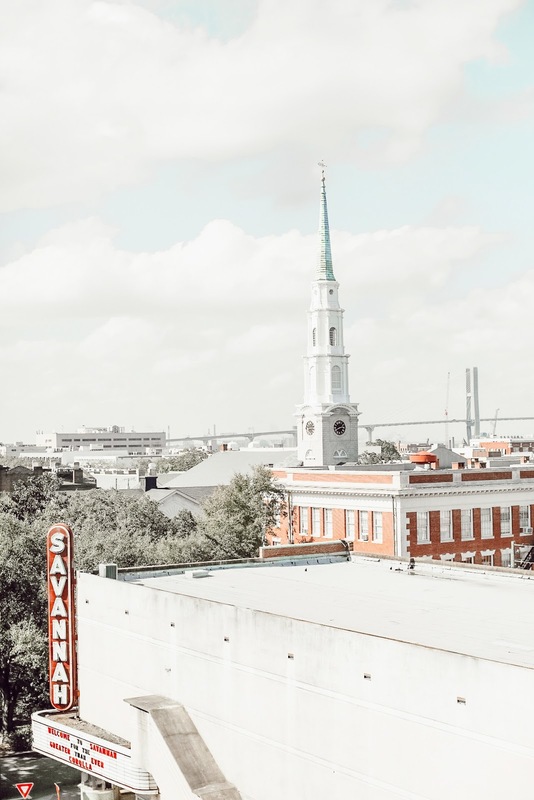 Ok so you're headed to Savannah, but where should you STAY when you get there? I'd recommend the brand new Alida hotel. 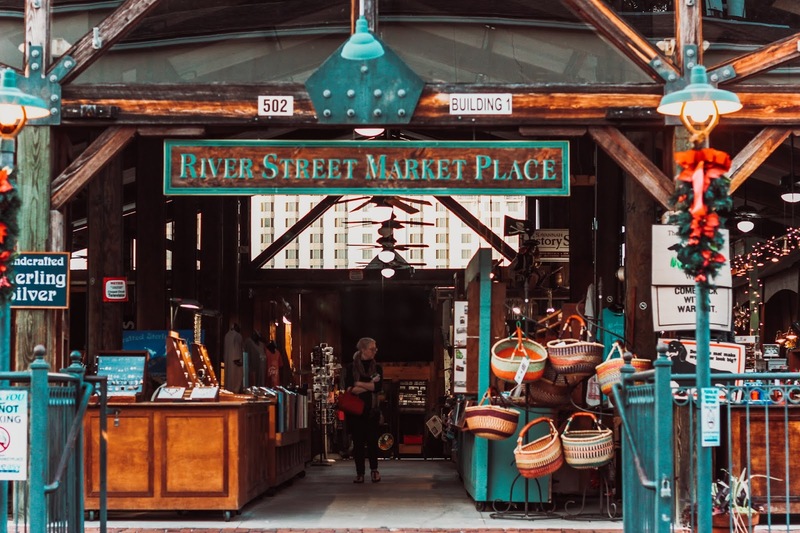 It's located on River Street, so you're within walking distance of the river, downtown, shopping, bars... everything. 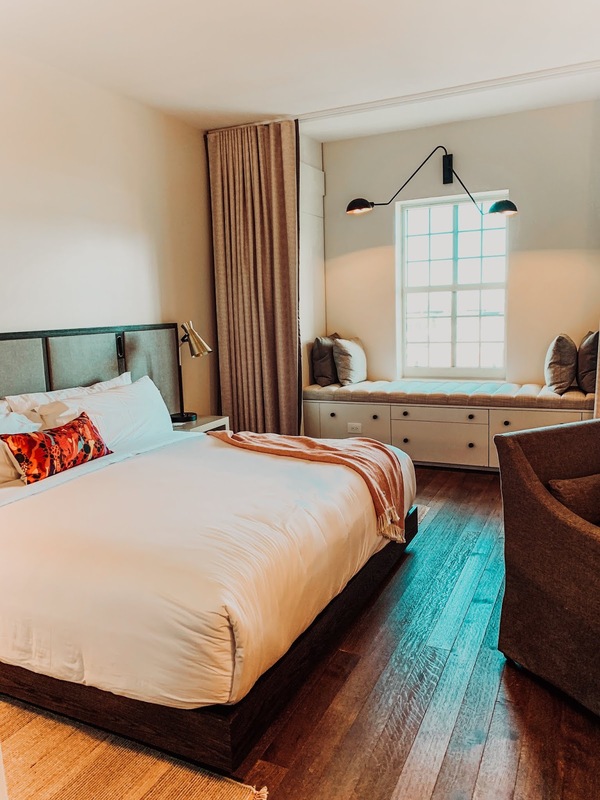 They have a rooftop bar called Lost Square (open to the public, so check it out regardless), a great pool with a pool bar, a wonderful restaurant on the bottom level called Rhett and even a cute retail shop where you can buy your very own custom-made-for-the-hotel, Stetson! 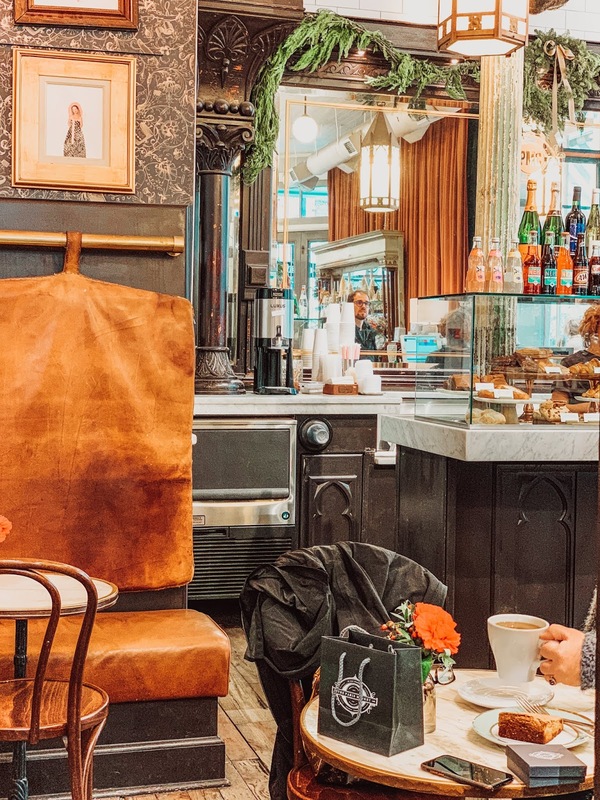 Beware, your cuteness overload meter is going to be set off when you enter this charming coffee shop and market. 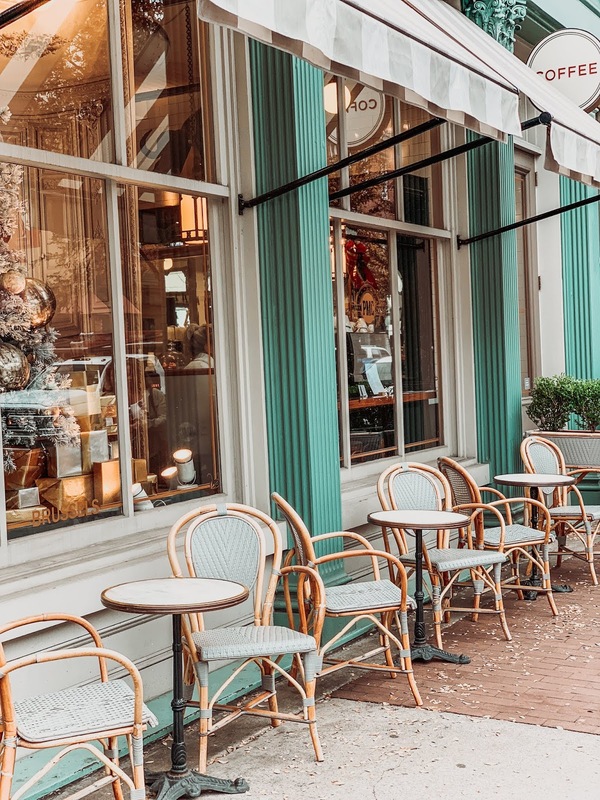 They have adorable, Parisian style outdoor seating for those beautiful Savannah Spring and Fall days. Shopping, wine and coffee - it's all of my favorite things! Think a French 75, good company and a world famous tomato basil bisque that you won't know how you lived without for so long! 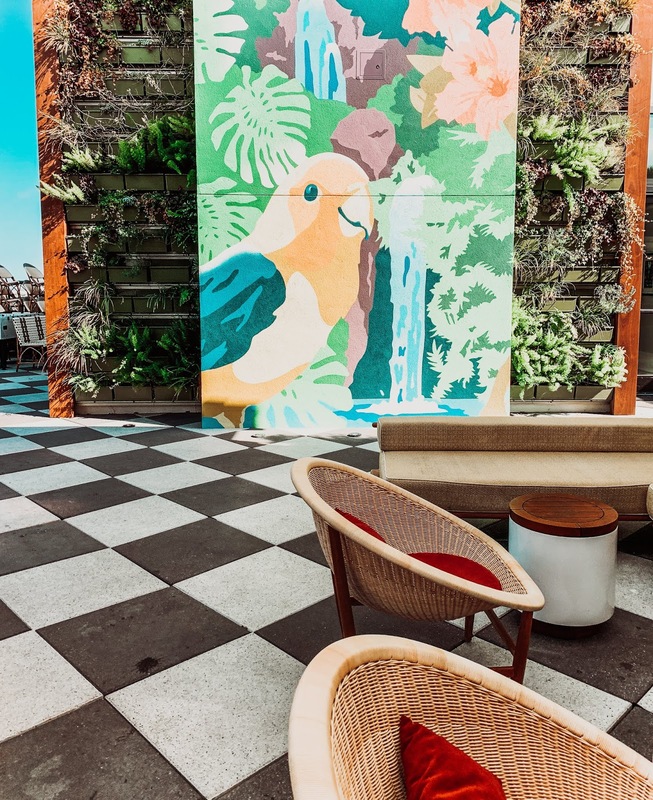 Located atop the beautiful Perry Lane Hotel is Peregin, a rooftop bar with amazing cocktails, a super cool mural, crazy good aesthetics and views for days! This is for sure the icing on a beautiful day spent in Savannah. 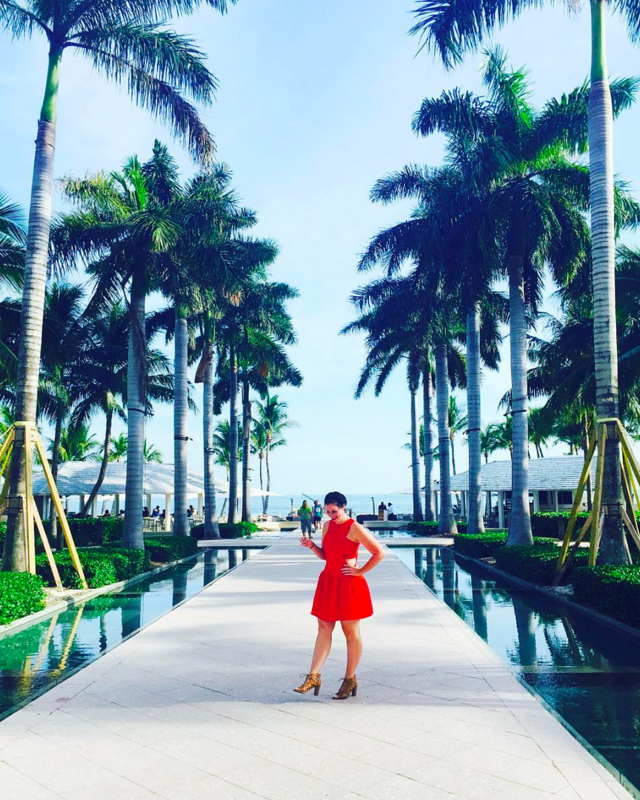 If you end up using any of the spots on my guide for your next trip, let me know via INSTAGRAM! 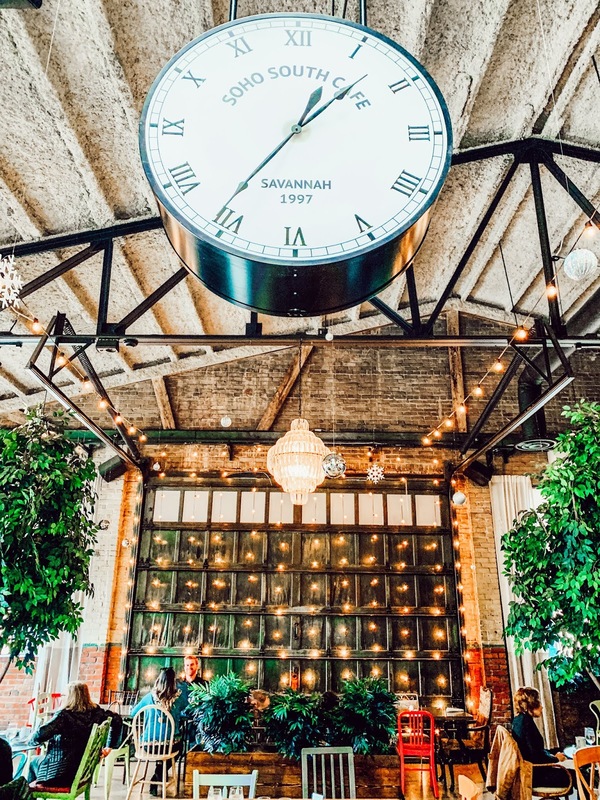 As I continue my travels to Savannah, I'll continue to update this guide, so be sure to pin for later - or for your next trip to Savannah.